Anyway, I wanted to becnhmark something different and in particular to test wine’s D3D command stream patches, so I decided to try the famous 3DMarks: 3D Mark 2001, 3D Mark 2005 and 3DMark 2006. 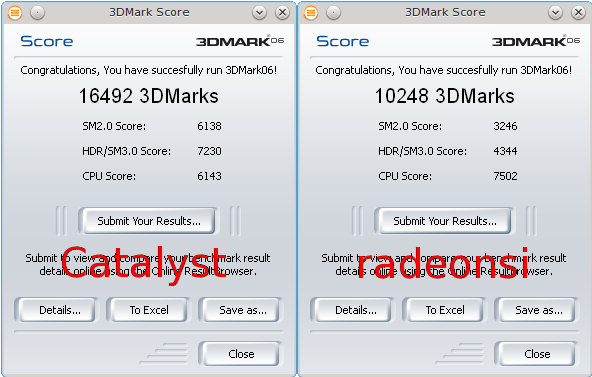 I did not test 3DMark 2003 because of this regression. I’m using default 3DMark settings and my video card is an AMD Radeon HD 7950. For radeonsi I’m using kernel 3.15-rc5 + PTE patches (VRAM page table entry compression) + hyperz (R600_DEBUG=hyperz). I’m also using libdrm git, xf86-video-ati git, llvm 3.5 git with a rebased Tom Stellard’s si-spill-fixes-v4 branch, mesa git (OpenGL core profile version string: 3.3 (Core Profile) Mesa 10.3.0-devel (git-57730d6)) and Keith Packard’s xorg-server glamor-server branch (1.16.0 RC 2). Catalyst version is 14.4 (kernel 3.14.3, xorg-server 1.15.1 because of compatibility issues). Wine version is 1.7.18 + Stefan Dösinger’s D3D command stream patches. What about you? Please share your 3DMark results and tell me which card/driver/wine version you are using. I am getting around half that (~21000) in 3DMark2001 with kernel 3.14.4 + drm-next + pte, mesa git, your llvm, your xorg-server and wine cs-0.8(d3dstream patch). My card is a Radeon HD 7750. Which CPU? Mine is Intel Core i7 3770K (Ivy Bridge). Is there a kernel with PTE patches already patched into it? Specifically for Ubuntu. I don’t know I’m sorry… I suggest you to wait a few weeks until 3.16-rc1 gets released.